Pre-threaded for easy assembly and labeled with an informative guide for efficient conduit bending. Fits aluminum bender numbers 910, 911, 930, 931, 940, 941; iron bender numbers 920, and 921. 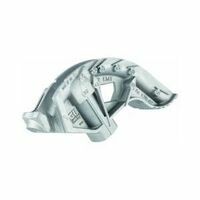 GB Hand Bender Head, Series: BigBen, 10, 22, 30, 45, 60 and 90 deg Bend, 3.69 in Bend Radius, Aluminum Body, Suitable For Use With Gardner Bender BH-75 Hand Bender Handle, For 1/2 in EMT Conduit Heat-treated aluminum hand bender for 1/2" Rigid and 3/4" EMT conduit, with a larger hook and a 40 percent larger foot pedal to allow for a booted foot. Highlighted industry standard markings with a 30 degree bend when handle is straight up, and a dual sight-line system for bending on the floor or in the air, embossed sight lines for 10, 22, 30, 45, 60 and 90 degrees, and a bend-back channel to correct conduit over-bends. Vise-Mate feature holds conduit while cutting or reaming. Head only, uses BH-75 steel hand bender handle. Includes embossed sight lines for 10, 22.5, 30, 45, 60 and 90 degrees. Holds conduit steady as it is cut to appropriate size. With built in 45 and 90 degree acrylic levels. Includes embossed sight lines for 10, 22.5, 30, 45, 60 and 90 degrees. Holds conduit steady as it is cut to appropriate size. With built in 45 and 90 degree acrylic levels.